In the year 1922, Icy’s husband died in May and Gus’s wife died in July. Icy was widowed with three girls and only a little settlement money from the coal company. Gus was widowed with six children, the oldest being Jessie at 16 years of age and the youngest Ray who was only 5 months when his mother passed. Both were in a predicament. The exact date is not clear when Icy and Gus met, but most likely it was some time between August and December of 1922. The story goes that Icy was visiting her sister in Cordova. She rode the train back to Guin, then hitched a ride with the post man (Gus Green) back to Hamilton. Most likely Gus was delivering mail with a horse and wagon, but it is possible he owned a car by that time. Whether it was a car or wagon, relatives report that they were engaged by the time they reached Hamilton. Joining forces to care for their new combined family of 9, the couple was married January 14, 1923. Their first child Gatmon was born in December of 1923. That made a grand total of 14 children between the two of them. Reportedly they bought their first house together in Hamilton with the settlement money Icy received from the coal company. Lemuel Augustus Green (Gus) was born March 28th in 1885 . 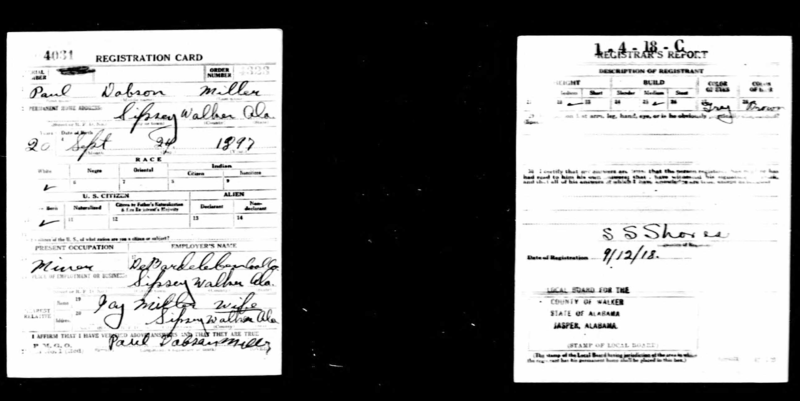 In the 1900 census he lived in Hamilton, Alabama with his parents James Winston and Mary E. Green. He had two brothers Richard and Henry plus two sisters Myrtle and Annie. Gus in the early days was a mail carrier between Bexar and Guin. He started with a horse and buggy and eventually owned a Model-T Ford to run the route. On July_, in 1922, Bertha was walking from the chicken coop to the house and collapsed. Reportedly she never regained consciousness. It is unknown what specifically caused her death. She was 36 years of age. Jessie would have been around 16 years of age and her youngest brother Ray was only a few months old. I wish I had more personal information about Bertha Green, but I don’t have a lot of details about her character. Maybe the family can lend some more information. Let’s begin this story in the early 1900’s with a blue eyed farmboy named Paul Miller. Paul was born and raised in rural Marion County, Alabama just outside of the town called Hamilton. He lived with his father Jordan, his mother Francis, older brother Walter and two younger sisters Sarah and Lily. From my research, the census actually lists a total of 10 Miller children over the span of 20 years but in 1914, the above listed are the only ones living at home. Like many of the teenage boys in Hamilton, Alabama during the early 1900’s, Paul completed a 6th grade education and then went to work on the farm, but farming was not what he intended to do for the rest of his life. Paul met and fell in love with Icy Estelle Northam, who also lived in the Hamilton area. I believe that Paul married Icy sometime in the year 1914. Paul would have been 17 and Icy 19. The couple was blessed with three girls. Their first child Rubye Ethyl was born October 4th in 1915. Rowena Francis was born February 9th in 1917. Three years later, she was followed by her sister Lillian Maxine on February 24th, 1920. I have done some research on what life would have been like in Sipsey, Alabama during this time frame. Sipsey was primarily a coal town, and nothing more. Just take a moment to imagine an entire town where every morning the majority of men would all don their mining hats with a single round light in the center of their foreheads. Slowly they would disappear for the day into underground holes or to transport the coal to the river or railroad. This would have left all of the women at home to tend to daily chores and children until their husbands returned at dark. I imagine laundry was fairly important to the women because her husband’s clothes would daily be covered in soot. Row housing for the miners would have been available for moderate rent. There was also a town Doctor and a small school. Unfortunately, mining could be a dangerous trade. I am sure Paul left for work kissing his wife and three daughters goodbye fully intending a normal day, but something went terribly wrong. Reportedly the mine he was working in collapsed and crushed his chest. He did not die immediately, but lived for nearly two months confined to his bed unable to move. He developed pneumonia and died on May 16, 1922. He was only 24 years old. Icy and her three daughters moved back to Hamilton so they could be near family. In the 1910 census, Jourdan states they had 10 children and only 7 were still living. The children living within the household in 1910 were Walter, Paul, Sarah and Lily. In 1920, Jordan Miller died at the age of 67. One interesting piece of information I came across about Jordan Miller is that he was the overseer of the Pauper’s Farm in Marion County. A Pauper’s Farm was a place for the homeless or wanderers to have a roof over their head but to also work the land in exchange. Paul worked for the DeBardeleben Coal Company. In the 1920 Census, Paul states that he rents his home. Household members are Icy, Rubye, Rowena, Maxine and Paul’s sister Lillie Miller. History fascinates me. As a child, I loved hearing my grandparent’s stories about the “good ol’ days” and tall tales that may or may not have been true, but they certainly were entertaining. My grandmother’s house was a treasure trove of old photographs and memorabilia. I can distinctly remember thumbing through dusty pictures and Maw Maw (Mary Clark) would say “aw that’s old so and so, you know who they are, they’re related!” Nodding in agreement, inwardly I was positive I had never met or seen that person before in my life and certainly couldn’t pull up the fond memories my grandmother seemed to enjoy. Nonetheless, I liked to look anyway regardless of my lack of knowledge, and those memories seemed to brighten my Maw Maw’s day. Now that I am adult and all of my grandparents have gone on to be with Jesus, I wanted to preserve those stories and tales. Slowly I started recording my own memories and quickly realized I needed help with the facts. After numerous interviews with family members and acquaintances, it occurred to me that I was naive to believe that this would be an easy undertaking. First of all, the stories are endless. Second of all, everything I have heard is either fantastic, interesting or I would even say …shocking. Third and last, THE INFORMATION IS COMPLETELY WORTH SHARING. So my conclusion: Why not start a blog? This way I can share what I know and any family members who want to submit their own stories or memories can absolutely join in the fun too.